Click here for audio of Episode 1741. Today, we meet the Witch of Agnesi. The University of Houston's College of Engineering presents this series about the machines that make our civilization run, and the people whose ingenuity created them. I have this neat old book on analytical geometry. The solution to one of its problems is a singularly gentle and graceful curve. It's called The Witch of Agnesi. But why? There's nothing sinister about this flowing line. It turns out that one person who worked with this curve was a noted eighteenth-century Italian mathematician named Maria Agnesi. So, problem solved: she was the Witch. Well, wait a minute. Let's meet the woman herself. 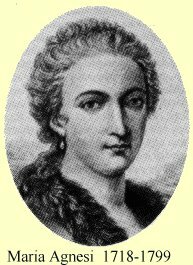 Maria Agnesi was born in Milan in 1718. Her father was a gentleman intellectual. She was a child prodigy and the apple of his eye. Yet Maria was shy and retiring, and, when she was twenty, her mother died, leaving the household in her care. She wanted to become a nun, but her father wouldn't hear of that. So they struck a deal. She would stay at home if she could attend church whenever she chose, dress simply, and avoid secular socializing. In that same year she published her first book -- a set of 191 well-organized philosophical propositions, what we would call a physics text. She defended it (as one might a thesis) in an open meeting. One observer said, "She spoke like an angel." Her major contribution was a two-volume treatise on the new differential and integral calculus, which she finished at the age of thirty. It was a major step in organizing the calculus and bringing it into general use. In this extremely important work, she showed how the calculus could be used to create the curve that would later be called The Witch of Agnesi. Her queen rewarded the treatise with a gift, and the Pope arranged for her appointment to the faculty of the University of Bologna. She remained on their rolls for forty-five years, although she never took up the appointment. Instead, she did charitable works and taught mathematics in one wing of her father's house. When Agnesi was 34, her father died. Then she put mathematics aside and got on with her real business. She turned to charitable work among the poor and sick. She sold her belongings to raise money to create a retirement home for the poor. She worked steadily until she herself died in that poorhouse at the age of 81. After that, our "witch" was labeled "an angel of consolation." Here was a woman who seized the world's attention with brilliant mathematical work and then gave it all up for a half-century of self-sacrifice. That is not the stuff we usually take witches to be made of. So where did the term Witch of Agnesi come from? Well, that curve was called a versiera, or that-which-turns. But the Italians have another word, l'aversiera, which means she-devil or witch. When a Cambridge professor translated her book into English, he turned versiera into witch -- into l'aversiera. And that is how this saintly mathematician became a witch. Years ago, I originally did this in a version (Episode 217) based upon Lynn Osen's very accessible book, Women in Mathematics. Cambridge, Mass. : MIT Press, 1974, pp. 33-48. More recent scholarship greatly expands upon that and corrects some errors of fact.